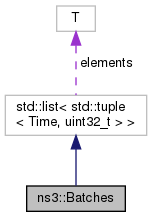 Class representing sets of (time, number) tuples with support of reading writing to streams. Definition at line 36 of file batches.hpp. Definition at line 41 of file batches.hpp. Definition at line 49 of file batches.hpp.